hey, long time no post. i'm a little busy recently. those tryout thing has drives me crazy. gosh, i think my school is the only school that give it students tryouts every week! it really drives us crazy, exhausted, and frustrated. but, i have a new mood-booster. 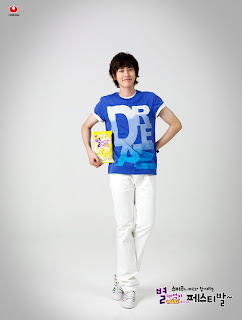 please welcome, cho kyuhyun of super junior. well, at first i'm not a super junior fans because i think it a little bit crazy to memorize the face and name of the 13oys. but i got it wrong. 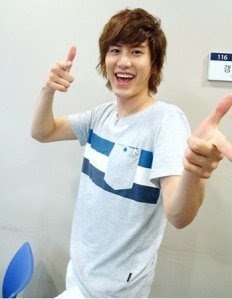 when my friend showed me 'seoul song' mv i got stuck to kyuhyun. gosh, he got adorable smile and amazing voice. 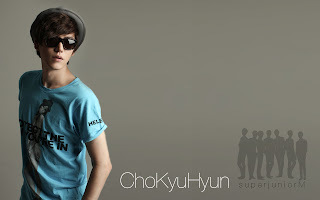 kyuhyun was the 13th member of super junior. he's the youngest among the 13oys. 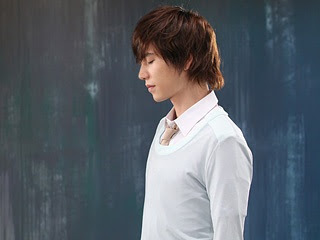 beside super junior, he's also the member of super junior m and super junior k.r.y. super junior m is a sub-group of super junior for chinese marketing while super junior k.r.y is a sub-group consist of the best vocals on super junior, kyuhyun, ryeowook, and yesung. super junior songs was amazing. 'sorry sorry', their first single from their third album was a hit. but, my favorite song from super junior is 'it's you'. gosh, this song has a great meaning, great melody, great mv! the best mv of super junior in my opinion. lately, i've been watching all super junior's mv, downloading every show that have kyuhyun appear in it. my friends gave me all the videos of super junior, start from the mv, performance, even the reality show, such as intimate note, star king. i downloaded star golden bell, come to play, and others. gosh, i think i'm addicted with kyuhyun. few days ago, my friend gave me 'super junior super show 1' and 'super junior premium live in japan' videos to me. i've watched it and i was amazed. the show was great and i think it was the best concert i've ever watched. the stage, the choreography, the costumes, the voices all great. and i really can't wait to see super junior performing live in front of my eyes. i'm pretty hopeful for super show 3 live in jakarta since it not possible for super show 2 because they're going to record their 4th album.